A current input into the base of the transistor allows for a much larger current across the emitter and collector leads. NPN and PNPs are exactly the same in their function, they provide amplification and/or switching capability. How they differ is how power must be allocated to the pins for them to provide this amplification or switching. Since they are internally constructed very different, current and voltage must be allocated differently in order for them to work. Also, since voltage is allocated different, they have opposite current flows. 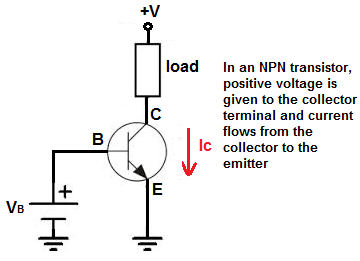 In an NPN transistor, current flows from the collector to the emitter. In a PNP transistor, current flows from the emitter to the collector. How they turn on and off is also different. 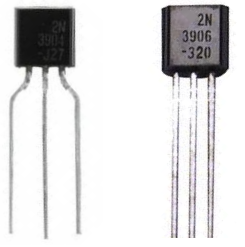 An NPN transistor is powered on when a sufficient current is supplied to the base of the transistor. Therefore, the base of an NPN transistor must be connected to positive voltage for current to flow in. A PNP transistor is the opposite. Only when there is no current at the base will it turn on. And to ensure that no current enters the base, the base must be grounded (connected to ground). If any current goes into the base of a PNP transistor at all, the transistor will not conduct across from emitter to collector. So knowing this, an NPN transistor turns on by a high signal (current). And a PNP transistor turns on by a low signal (ground). Since PNP and NPN are composed of different materials, how voltage is biased to them to produce current flow is different, and their current flow is opposite as well. In an NPN transistor, current flows from the collector to the emitter. In a PNP transistor, current flows from the emitter to the collector. PNP transistors are made up of 2 layers of P material sandwiching a layer of N material, while NPN transistors are made up of 2 layers of N material sandwiching 1 layer of P material. Really opposites. Therefore, to produce current flow from collector to emitter in an NPN, positive voltage is given at the collector terminal. 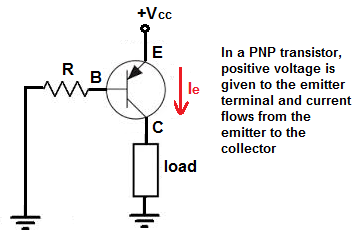 For a PNP transistor, to produce current flow from emitter to collector, positive voltage is given at the emitter terminal. A PNP transistor receives positive voltage at the emitter terminal. The positive voltage to the emitter allows current to flow from the emitter to the collector, given that there is no current flowing into the base. As you increase current to the base of a NPN transistor, the transistor is turned on more and more until it conducts fully from collector to emitter. And as you decrease current to the base of a NPN transistor, the transistor turns on less and less, until the current is so low, the transistor no longer conducts across collector to emitter, and shuts off. When there is current at the base, the transistor is off and does not conduct to power the load connected to it. When there is no current at the base, the transistor is on and conducts across to power on the output load.